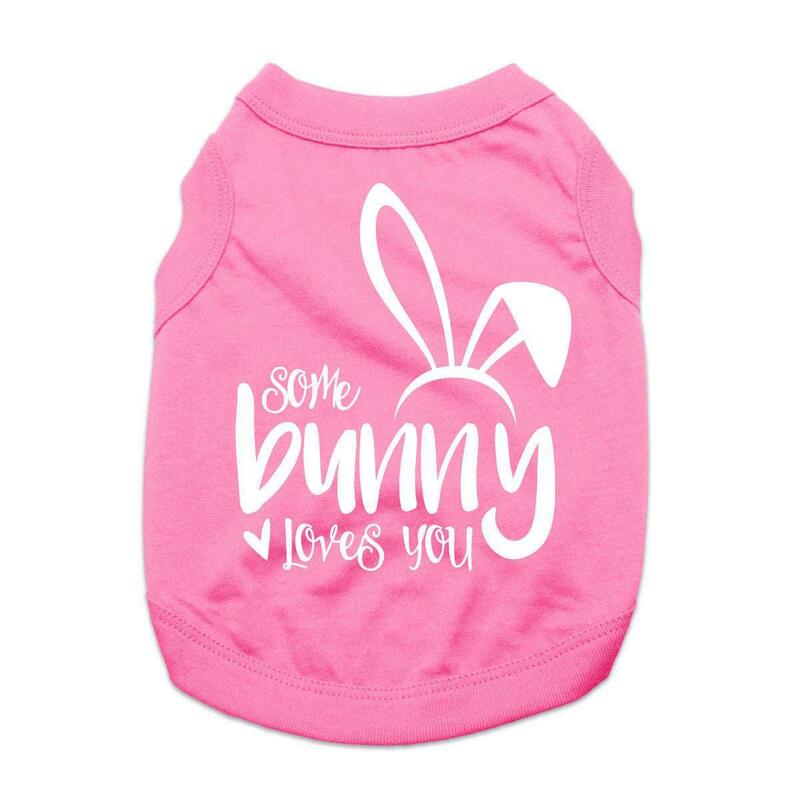 Hop into love this Easter with this fun and adorable Some Bunny Loves You Dog Shirt! 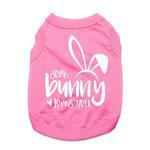 The Some Bunny Loves You Dog Shirt shows off your loving dog this Easter! This dog t-shirt features a high-cut, stay-dry belly for ultimate comfort and convenience. This exclusive design has been lovingly and carefully created for you in our BaxterBoo.com T-shirt shop. Available in a wide array of sizes, you can easily outfit the whole gang! This darling Easter shirt is made of 100% cotton. Machine wash cold and dry flat for best results. Great for Easter gifts, photos, and baskets! Some Bunny Loves You Dog Shirt - Pink Customer Photos - Send us your photo! Pretty in Pink... saydee loves her tee.. waiting for the easter bunny.. Tee is soft and comfortable. Cousin Sierra is loving her new tee and Lucy appears of it as well! The “Some Bunny Loves Me” T-shirt is just too cute on my babies! Our little Princess Angel looked so cute in her little pink bunny shirt. So nice and lightweight, fits perfectly and she was adorable at all the Easter events we attended. Stats: 55 lb pit mix, 22” L, 18” N, 26” C. XL fits well, easy to put on dog, and washed fine (line dry first time, no shrinkage). Posted On 03/08/19 by Karen L from Dearborn, MI Yes, Karen L recommends this product! The XL fits my 55 lb, 18” N, 26” C, 22” L Am Staff mix perfectly. And she knows lots of “some bunnies” love her ! Posted On 04/08/18 by Goodyear from Goodyear, AZ Yes, Goodyear recommends this product! Cousin Sierra needed an Easter outfit so she picked this adorable bunny tee. The pink is definitely her color and she loves it! This was a gift, but it was very cute and of good quality. Posted On 04/26/17 by holli t from Hale, MI Yes, holli t recommends this product! 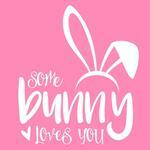 We love the new shirt in Pink with the writing on it, Some Bunny Loves You. We have one for almost all the holidays and we've never been disappointed yet. Everywhere we go people ask where we shop and we're always happy to say Baxter Boo.com... thank you Baxter Boo. Holli T.
The tshirt is perfect for my female shih Tzu. It does run small and would recommend ordering a size larger to fit. Little Princess Angel looked so adorable in her little bunny shirt for Easter. It is light weight and comfortable and fit perfectly. And, as the shirt says, "Some Bunny Loves You". I think everyone loves her. Posted On 04/10/17 by MICHELLE O from New Underwood, SD Yes, MICHELLE O recommends this product! Posted On 04/03/17 by Lisa B from Brimfield, IL Yes, Lisa B recommends this product! I have a small Westie at 14 lbs. I ordered the medium and it fits her great. She is all ready for the doggie Easter egg hunt she is going to. Posted On 03/30/17 by Debbie W from Montgomery, AL Yes, Debbie W recommends this product! We purchased this little shirt for Angel Baby and it is cuter than we expected. The colors were perfect and we love this little shirt. Posted On 03/29/17 by Sharon W from Metairie, LA Yes, Sharon W recommends this product! Such a pretty color pink...can't wait for my Queenie to wear this Easter week! Posted On 03/28/17 by Christine B from Olive Branch, MS Yes, Christine B recommends this product! Posted On 03/27/17 by Diana from Sheboygan, WI Yes, Diana recommends this product!